Since its introduction in 1978, the Rockwell AIM 65 "Advanced Interactive Microcomputer" has remained successful and unchallened in its particular niche in the micro spectrum. Its unique combination of full size keyboard, built-in single line display and built-in printer have earned it many friends, especially in Education and Industry. Educationalists like the relatively low cost of providing a complete computer to a student, including permanent print-out copy for notes, and avoiding the need for a bulky TV monitor. The well-written documentation and the built-in machine code features have also proved factors in the choice of AIM 65 for computer laboratories. Industrial users comment favourably on the compact solution to those computing problems where user guidance, keyboard entries and hard copy have to be provided on desk or bench. 6502-based microcomputer, crystal controlled at 1MHz. On-board sockets provide space for 4K NMOS RAM in 2114 type ICs, plus five sockets for 4K 24-pin ROMs. As supplied, the E and F sockets are fitted with the 8K monitor. The D socket is used for the two pass assembler ROM, or for a PROM version of a BASIC user program, or any other convenient use. BASIC, Forth or PL/65 are designed to occupy the B and IC sockets, while Pascal requires these sockets plus three off-board sockets in an extension board such as CU-MEM. The Facilities offered by the 8k monitor include initialisation at power-on to provide a prompt in the display awaiting a command from the keyboard. At this point the user may enter BASIC or Assembler by pressing 5 or N, or may examine memory (M), enter the text editor (E), dunp or load memory to or from tape or other defined medium (D, L), examine CPU registers (R) change A, X, Y registers, stack pointer or address pointer (A, X, Y, S, *). A dual interface to cassette tape with motor control allows tape to tape assembly. The hardware designer can benefit from the use made of 6502, 6520, 6532, and 6522 devices, and can use the spare 6522 exactly as required. All the connections from the tape interface, the spare 6522 and the CPU itself are brought out to 44 way connectors at the rear of the board. The printer is fully controlled under software, and prints 20 columns wide onto thermal paper. The display is made up of "starburst" 16-segment red LED displays to give a 20 character single line display which scrolls in use for convenient viewing. See under Documentation" for prices of Rockwell manuals bought separately. See under "Expanding the AIM 65" for details of Control Universal boards and disk system for providing extensions to the AIM 65 such as video, PROM programming, more i/o channels, analogue, disk storage, etc. 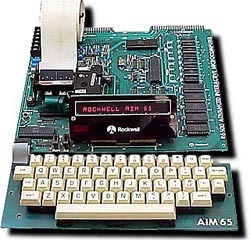 See under "Microflex Modules" for details of Rockwell's own range of AIM 65 extension cards. See under "Enclosures" for the choice of cabinets for AIM 65. See under "Power supplies" for the choice of power supplies for AIM 65.